Changing hashtag would involve changing dozens of posts from previous coverage, but would the clout of the BBC mean missing out on a potentially more successful hashtag? Thankfully there are ways of finding out. And the results are surprising. The analytics tool Hashtagify allows you to search for hashtags and find out their relative popularity, along with trends and related tags. When #brumvote and #brumvotes are entered into the tool there’s a clear winner – and it’s not the BBC. 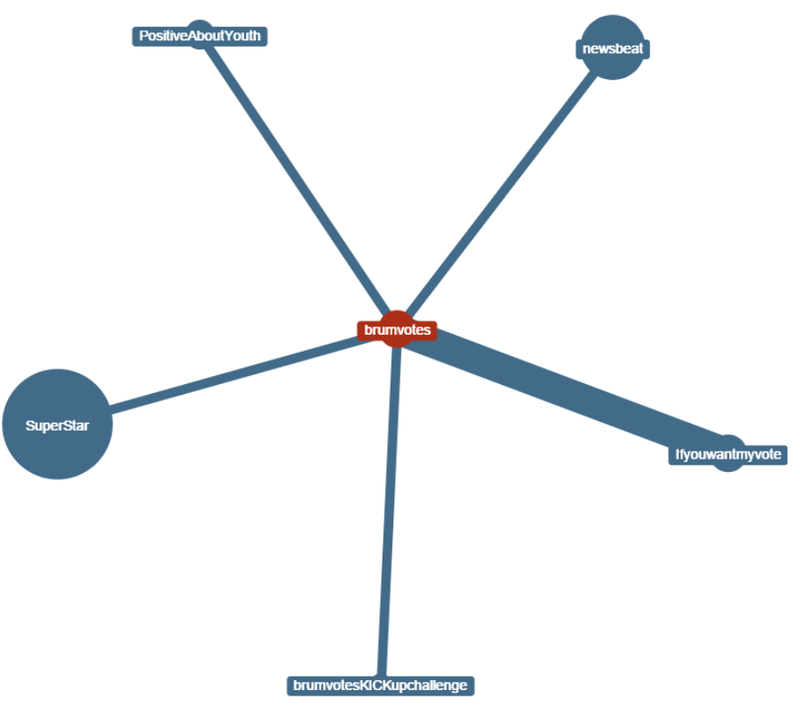 These networks can not only help identify audiences, but also sources and possible alternative hashtags. The thickness of the line, by the way, indicates the correlation: #ifyouwantmyvote, for example, is heavily correlated with #brumvotes because it was invented by the same team. And of course there are two very obvious national hashtags for the election which start to crop up here as well: #GE2015 and #GE15. Despite its brevity it seems that #GE15 is losing out, with its popularity rating of 53.4 lagging behind #GE2015’s 60.3. As you can see, it’s not entirely reliable: #brumvotes15 shows zero tweets per day. In the end the decision on which hashtag to use doesn’t come down simply to popularity. On that basis alone you might decide to abandon #brumvote and stick with the two more popular variants. But hashtag popularity is not the same as reach. Popularity refers to how often a hashtag is used. But who uses those hashtags is important too in terms of how many users see it (impressions). The tool Tweetreach allows you to get a broad idea of reach for any hashtag – and here the results are very different – at least when it comes to the most recent couple of days (you can pay $20 for a report which covers more tweets). Why such a big difference? Well although the @brumvotes Twitter account has fewer than 500 followers, it does have colleagues with large followings. The ‘top contributor’ listed by Tweetreach for #brumvotes is the official account for local news programme BBC Midlands Today with over 90,000 followers. And the most followed user of the #brumvotes15 hashtag is the official account for Birmingham City Council, with almost 109,000 followers. (caveat: accounts with higher follower numbers tend to have lower engagement rates). Neither account seems to have been aware of – or at least used – #brumvote – despite it being used before the other hashtags. Perhaps the students could have been savvier in targeting the council and local media with their tweets? Ultimately all the numbers and charts above don’t make a decision for you. 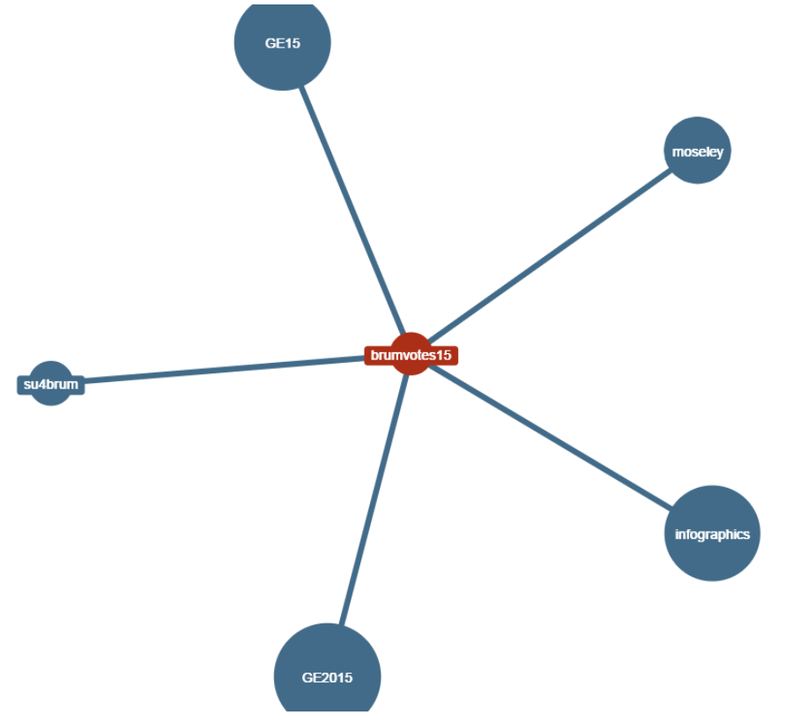 Look closer at the network diagrams and you see that each hashtag has its own audience, and using more than one where possible – not always the same ones – might be the most effective approach. When it comes to reach it’s worth asking ‘Are those accounts with big followings actually reaching the target audience?‘ After all, while BBC Midlands Today may have used #brumvotes occasionally, its audience – at least on TV – is not a particularly young one (there are a number of tools which will give an indication of your own Twitter followers’ demographics). The most popular hashtag – #GE2015 – might actually be less effective, because the competition is so fierce and your content less relevant to the majority of the audience. 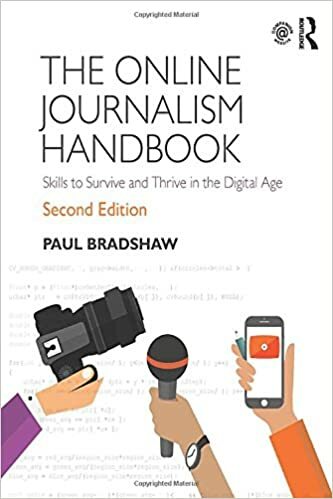 Ultimately, choosing a hashtag means following the same rules as journalism has always followed: know who your audience is, and what words will communicate most effectively with those. On that basis, one hashtag does not fit all, every time. Hashtags originally served as a way to attach a tweet to a wider discussion, but they have also evolved to serve a second purpose: branding. Ultimately, two of the three hashtags are also brands. And even #brumvotes15 could be argued to be the ‘official’ hashtag given its adoption by the council. It’s for this reason that the BBC used their own #bbcbudget hashtag rather than the more popular (and obvious) #budget15: if you wanted to follow the BBC’s coverage, or respond directly to it, you could do so. So the final tip perhaps is that the choice of hashtag can also be a choice of branding: a statement about what the user can expect in terms of style and angle, and the people they are talking with. Obviously the branding isn’t achieved by the hashtag alone, but by the content that becomes associated with it over time. 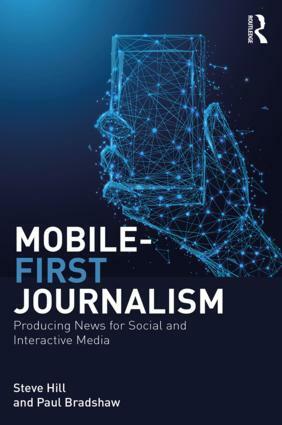 On that basis, a hashtag is no longer just a description of the subject matter – it’s a signal of how that subject is going to be treated, and by whom. And at that point, it comes back to the fact that no hashtag can make up for bad journalism. At around 8pm on election day itself I took another look at the analytics for all three hashtags, using the tool Bluenod. 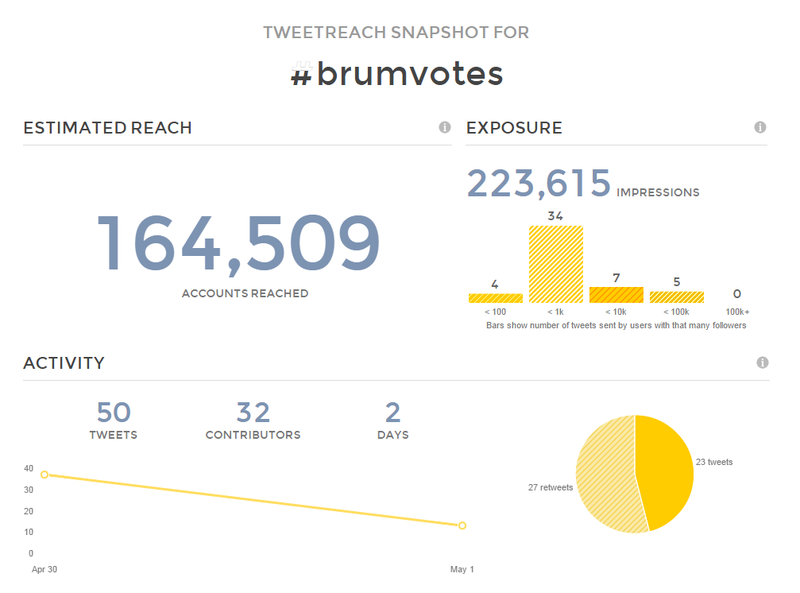 The #brumvotes hashtag had gone very quiet, with only 37 tweets over 20 hours, and 40 users (I’m not sure how 40 users can send 37 tweets but that’s what the tool said). 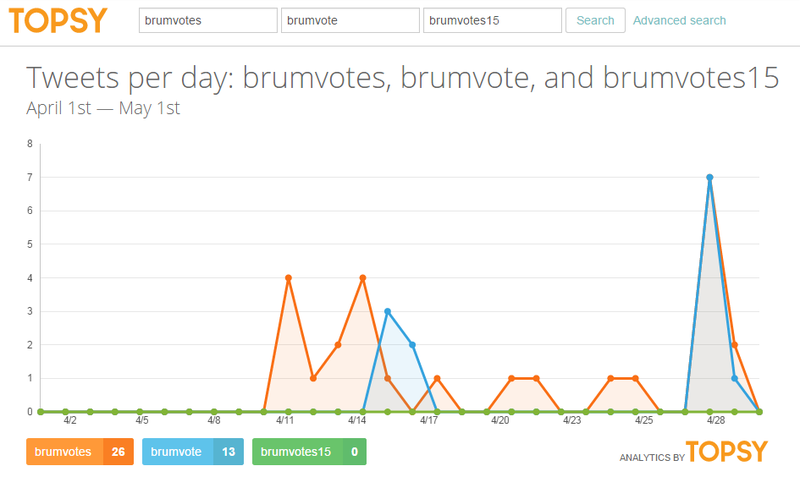 The #brumvote hashtag had 175 tweets from 70 users over the same period. 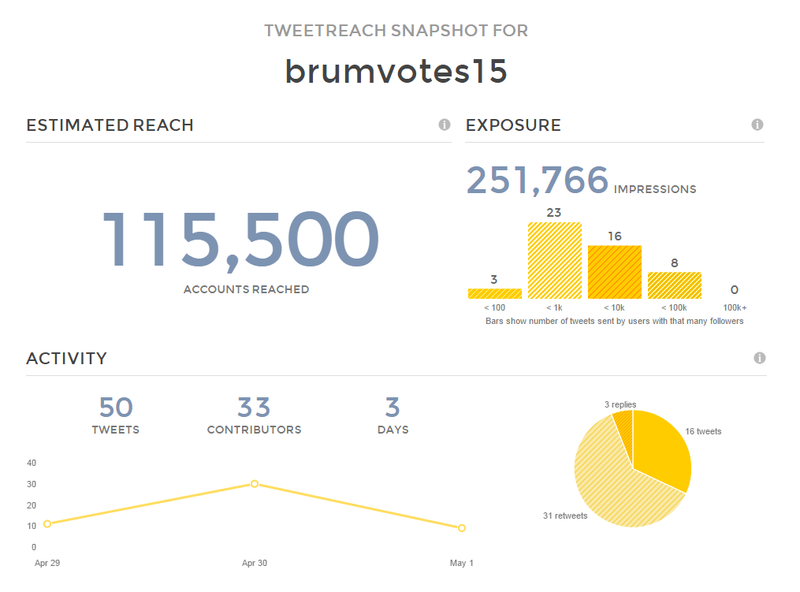 The #brumvotes15 hashtag had 274 tweets from 176 users. Part of the reason for this was that the @brumvotes account had ceased activity until polls closed at 10pm (due partly to broadcasting restrictions). 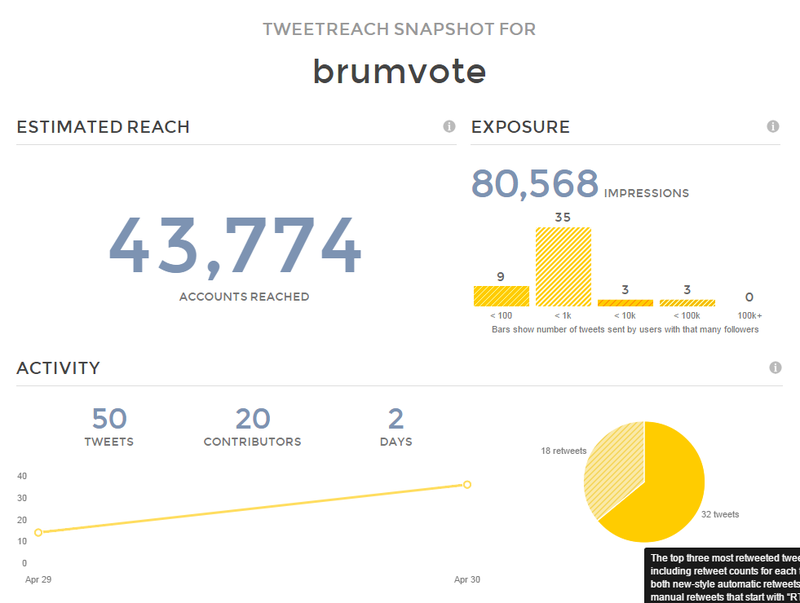 Indeed one of the biggest users of #brumvotes had been the creator of the #brumvote hashtag: the @bhameastside account. NOTE: There will be no online coverage of any of the election campaigns on polling day, until polls close at 22.00pm. The point here is that if you’re relying on one organisation to maintain a hashtag – i.e. it’s not widely used outside of that – then you may find yourself stranded if they stop using it for any reason. A more widely adopted hashtag – in this case #brumvotes15 or even #GE15 – is more resilient. For what it’s worth, I don’t see the point of adding a year to a hashtag because tweets are time-stamped anyway. Those were my thoughts too. I can’t see people looking at #brumvotes and wondering which year it refers to. Thanks for including TweetReach in your piece! We love seeing all the different applications there are for our snapshot reports in action.